Architectural Construction Documents | Leavitt Associates, Inc. 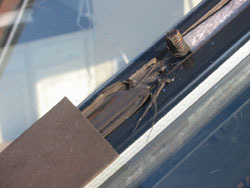 The lightweight construction used today is more prone to damage from leakage than the massive buildings of yesterday. Greater than average expertise and attention is needed to address exterior window, wall, roofing and below-grade conditions. Problem-solving firms with experience in remedial work are attuned to potential problems and highly motivated to avoid them. More detailed and reliable construction documents means fewer problems in the field. These are all reasons to consider using Leavitt Associates to produce construction document packages for the building exterior, in association with a design or interiors architect. Leavitt Associates’ involvement with field investigation and remediation makes us better designers, because we understand the advantages as well as the limitations of the products and systems we specify. 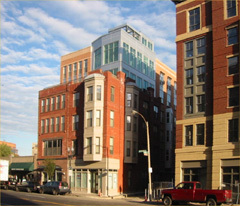 The need to preserve an existing historic façade during construction, plus a strong resolve by the Owner and Contractor to avoid leakage issues in this luxury condominium, led the Owner to retain Leavitt Associates to do the construction documents, in association with Hacin Associates as Design Architect. The design of this luxury building included extras such as penthouse terraces and ornamental cast-stone trim around the windows, that presented difficult waterproofing issues. We stopped the leakage at a historic skylight in Boston's Back Bay using a two-stage silicone seal, including pre-formed silicone gasket, with copper bars covering the silicone to preserve the historic appearance. The cost of our solution was one fourth of a proposed reconstruction.